KTA Super Stores has been serving the Hawai‘i Island community for over 100 years. Join one of the islands oldest locally owned and operated business. Our KTA ‘ohana welcomes you to be a part of our team, so together we can show Hawai‘i what it truly means to be "someone special". Refer to the store location below for a list of available positions. Grocery Supervisor (full-time) Click here for position details. - Previous experience as a Grocery Supervisor required. There are presently no positions available. 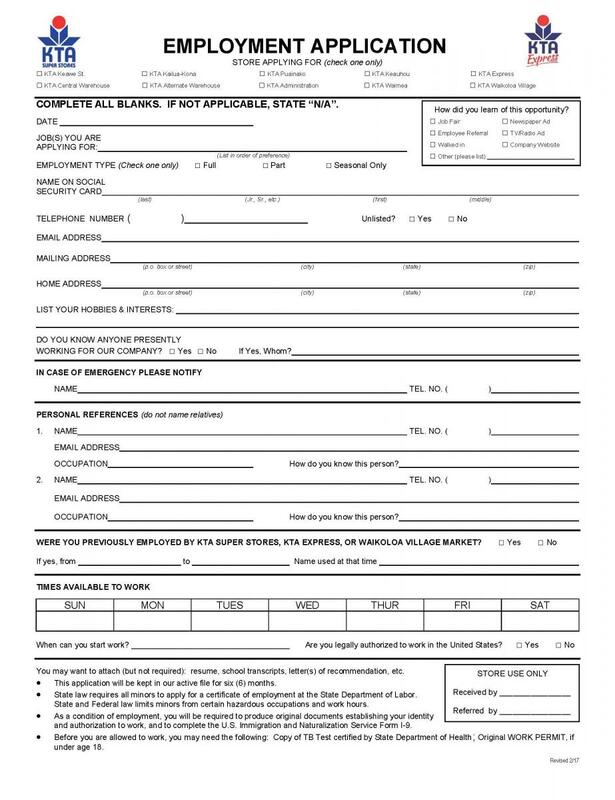 Download and print an Employment Application (on the right). Submit your application in person at the store location you wish to work at. NOTE: If you are unable to download the Employment Application, copies are available at each store location. See store's Customer Service Center for more details.